You know Oðin, the one-eyed god in Norse mythology. He’s the big cheese, the head honcho, the CEO of Asgard, the home of the gods. He’s always fighting frost giants, involved in battles, wandering in search of wisdom, preparing for the end of the world, Ragnarok. At least that’s the Oðin, I´ve known. Feasting, fighting, wenching, wandering, drinking. However, I´ve stumbled on another aspect of Oðin. Some people say Coca Cola invented Santa Claus. Other people say Santa Claus started when the Vikings invaded England and brought with them the idea of Oðin, the wanderer in the blue hooded cloak who carried a bag of bread in one hand and a staff in the other. The Saxons, the guys already in England, had as one of their customs the welcoming of King Frost or King Winter. It wasn´t hard to join together King Winter and Oðin. It wasn´t unusual for pagan beliefs to be joined with Christian beliefs. At my recent visit to the Royal Museum to see the Viking exhibit, there was a Thor´s hammer that was also a cross. It´s not surpring then that even after the battle of Stamford Bridge in 1066 when the Vikings lost their power in England, when people made oaths, they sometimes still used the phrase “To God and Oðin.” The mysteries of the past that come down to us are many layered. The Vikings didn´t just bring swords and shields. They brought their beliefs; they brought Oðin. Vikings believed that Oðin would come to earth on his eight legged horse, Sleipnir. The Oðin described in histories of Christmas is a man who joined people sitting around fires, not participating but listening and observing, seeing if the people were all right and, sometimes, if things were not all right, he would take bread from his sack and leave it for those who were poor and hungry. It is easy to see the image of Santa Claus beginning to form. A man on a steed. The blue hooded cloak, the unobserved man coming to see if all was well, the leaving of gifts for those in need. When the Normans came they brought St. Nicholas. For a long time, the image of a benevolent person who came at Christmas time was saintly, stern, lecturing and judging. In a number of countries, he asked questions and decided if you had been naughty and nice and if you had been naughty, you got a lump of coal, or some hay or a potato instead of a desired gift. Before they became Christian, the Germanic people celebrated Yule. When people became Christian they didn´t automatically give up their traditions and beliefs. Yule celebrations became part of Christmas. For people of Icelandic descent, this keeping of old traditions in spite of the new religion is easy to understand. After all, when a political deal was made for Iceland to become Christian, part of the deal was that people could keep practicing the old religion as long as they did it in private. If you know your Norse mythology, you’ll know about one of these traditions, The Wild Hunt. When the Wild Hunt takes place, there is a ghostly procession of hunters led by Oðin riding across the sky. When I think about this ghostly procession I remember the Northern Lights on cold clear nights in Gimli, Manitoba. 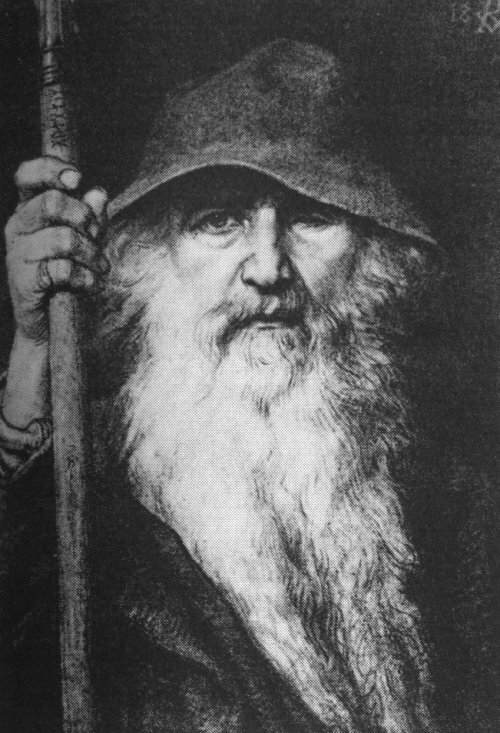 When Oðin leads the procession, he is called Jólnir or Jule figure. He is also referred to as Langbarðr which means long beard. So, we have a long bearded figure in a hooded cloak, riding an eight legged horse across the sky. It´s not too hard to see Oðin turn into Santa Claus and Sleipnir with his eight legs turn into eight reindeer. There are even some traditions of Oðin coming down chimneys. Although, that couldn´t have been an Icelandic tradition since turf houses didn´t have chimneys. There were no stoves or fireplaces, just a fire on the stone floor and a hole in the roof. In Reykjavik today, Oðin or Santa Claus would still have a hard time finding chimneys to climb down because most of the heating is from hot water piped from volcanic areas. No chimneys for a fat man in a red suit with a large bag of toys to scurry down. For that trick, he needs the chimneys of large stone fireplaces. A lot of people got into the act before we moved from Oðin to our present day image of Santa Claus. St. Nicholas and Sinterklass and Father Christmas plus others. The result is that we no longer have the all-knowing Oðin, no longer the stern saints, no longer the demanding Santa Clauses in shopping malls insisting on knowing if you have been good or bad. Instead, we have a jolly old elf. A gift giver who makes no demands, asks no awkward questions, does his best to meet extravagent requests even if it means maxing out a credit card. I used to be terrified when I heard the song that said, “He knows when you are sleeping, he knows when you´re awake, he knows when you´ve been bad or good so be good for goodness sake.” I prefer the jolly old elf, an elf filled with kindness at the darkest time of the year. Yet, yet, in the winter months, especially around Christmas, if I’m lucky enough to be where there are Northern Lights, I am transfixed by the pulsating colors, red, green, blue, traveling across the sky. Watching them I think I see this figure in his blue cloak, riding his eight legged horse over the arc of the world, leading his wildly riding huntsmen. Although I am in awe of these spectral figures, of the shimmering lights, of the majesty of the sky, I have not yet been given a gift of gold. At the same time, I haven´t mocked these huntsmen and so haven´t been taken away with them never to be seen again. All of this, along with the multiple layers of tradition over the centuries, have often led me along a snowy path to a quiet church service, some joyful singing of hymns and carols, a crèche scene with Joseph and Mary and Jesus. To Oðin, to Frigg, to all their companions, to Father Christmas, to Saint Nicholas, to the Frost King, to all the Santa Clauses in the malls of the world, to mothers and fathers decorating the sacred Christmas tree, the lovers kissing under the magic Christmas bow, to Joseph and Mary and Jesus, Merry Christmas to all.